<\/u><\/b>This is a striking blue owl wearing a bright pink tutu on a light aqua blue\/green background with numerous small heart shapes to the front of the bird. The cabochon has a real shimmer to it, giving it a wonderful effect. It is a large round cabochon on an intricate silver toned holder with vintage style decoration to the outer edge. 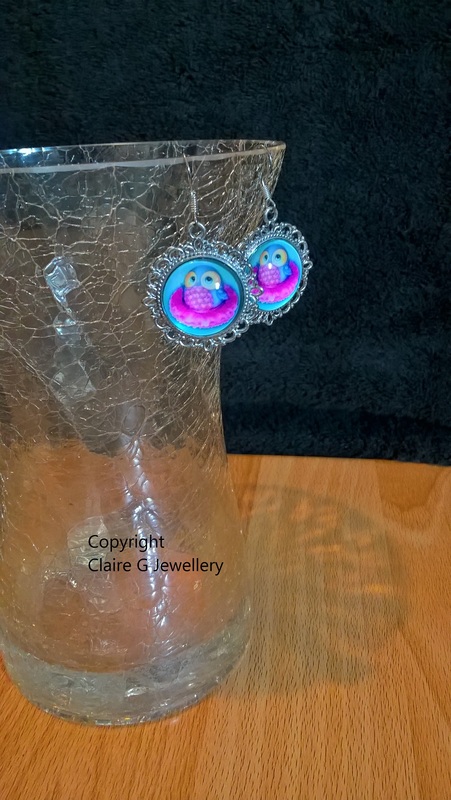 This would be great for anyone that loves owls, birds in general or bright colours. 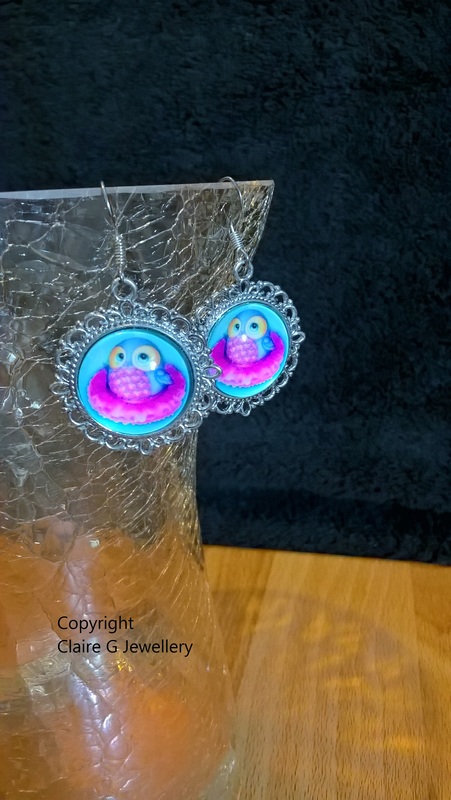 These are great if you prefer a slightly bigger\/more noticeable earring, have long hair or prefer a larger cabochon which holds more detail. Main colour\/s of cabochon design<\/u>: Blue, pink, yellow and aqua all with a shimmer effect. Colour\/style of cabochon holder<\/u>: Silver coloured plated alloy with vintage style intricate trim. This is a striking blue owl wearing a bright pink tutu on a light aqua blue/green background with numerous small heart shapes to the front of the bird. The cabochon has a real shimmer to it, giving it a wonderful effect. It is a large round cabochon on an intricate silver toned holder with vintage style decoration to the outer edge. 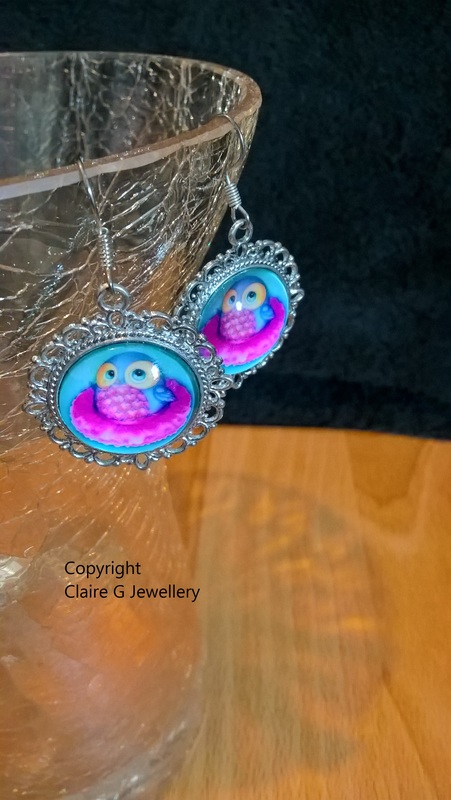 This would be great for anyone that loves owls, birds in general or bright colours. 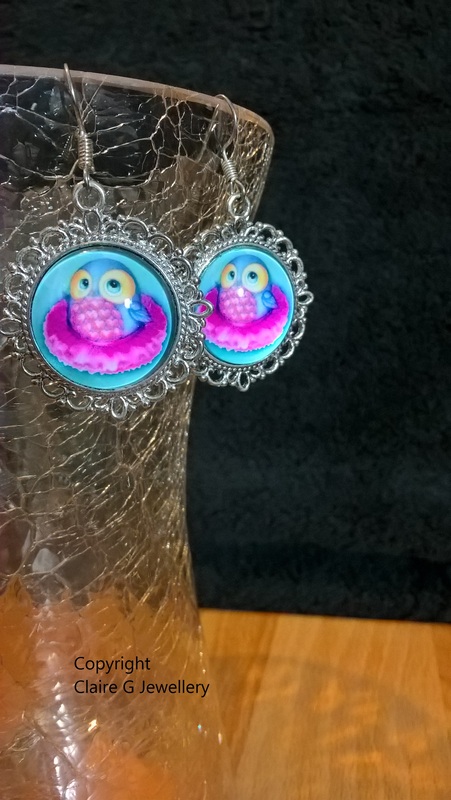 These are great if you prefer a slightly bigger/more noticeable earring, have long hair or prefer a larger cabochon which holds more detail. Main colour/s of cabochon design: Blue, pink, yellow and aqua all with a shimmer effect. Colour/style of cabochon holder: Silver coloured plated alloy with vintage style intricate trim.